“These lines provide a valuable function in connecting the city with a very widely distributed interurban district, and also run a through service to cities of considerable size. This history is hard-to-believe, but true. The idea behind the long-dead, century-old Woodward Avenue Subway proposal was to eliminate “traffic congestion” downtown, by moving the Woodward trolley tracks below street level, while keeping crosstown trolley routes at grade. The “traffic congestion” had nothing to do with automobiles. Downtown streets were often gridlocked with streetcars and interurban trolleys, at that time. 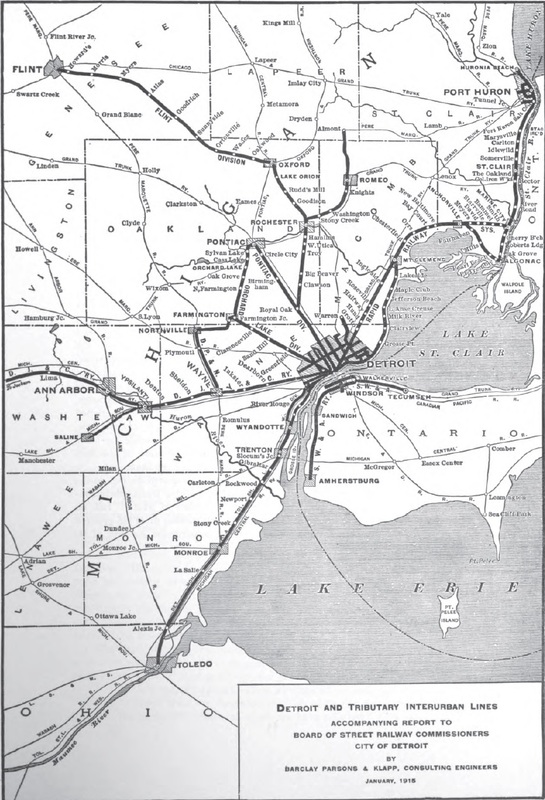 Given the political climate — a continuing thirty-year “war”, between the privately-held Detroit United Railway (DUR) traction monopoly, the City of Detroit, local newspapers, and an aroused citizenry — the subway proposal was eventually defeated. It lost by one vote, during a meeting of Detroit’s Common Council (today’s City Council). The Rochester / Romeo / Almont line was extended north to Imlay City, later in 1915. Highland Park & Royal Oak Railroad (aka “The Stephenson Line”) opened in 1919. Detroit’s city-owned municipal streetcars began running in 1921. In 1922, the “war” ended, when DUR sold its streetcar lines (within the city limits) to the City of Detroit, for c. $20 million. DUR went bankrupt in March 1925, the same month its new Gary Transfer Terminal opened on Gratiot Avenue (near French Road). The remains of this ninety-year-old, fire-gutted former interurban / bus station are currently still standing, barely. “Shore Line” interurban service, running between Grosse Pointe Park and Mt. Clemens (via Grosse Pointe Boulevard, Lake Shore Drive, St. Clair Shores, and Crocker Boulevard) ended in 1927. A historic plaque, commemorating the Detroit, Lake Shore & Mt. Clemens Railway, was erected at former-speakeasy Blossom Heath Inn (where Swing Shift Orchestra will be performing Wednesday, June 22nd). The remains of DUR emerged from bankruptcy as Eastern Michigan Railways (EMR) in 1928. That same year, Rapid Railway service between Leesville (Gratiot & Harper) and Port Huron ended. 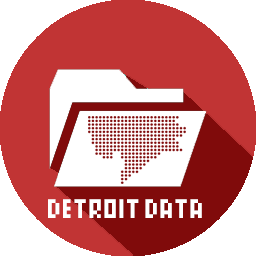 Detroit’s Department of Street Railways (DSR) continued running Detroit / Mt. Clemens streetcars along Gratiot Avenue for several years after. EMR discontinued Pontiac Division and Flint Division interurban service (north of Eight Mile Road) in 1931. DSR continued running streetcars, between downtown Royal Oak and the Fairgrounds Loop on Woodward, until 1948, using former interurban track. EMR walked away from its 56-mile, 28-year-old, mostly private-right-of-way Eastern Michigan – Toledo Railroad October 4, 1932. DSR continued running its West Fort Street streetcars along Electric Street, as far south as the city limits, until 1949. Cincinnati & Lake Erie Railroad re-located the northern terminus of its four-motor, 400-horsepower “Red Devil” streamlined trolleys from downtown Detroit to Toledo. Three daily, 80-mph trains had connected Detroit and Cincinnati, for little more than two years. In the spring of 1934, EMR (then in liquidation) walked away from its fifteen-year-old Stephenson Line — the last operating electric interurban line in southeastern Michigan. East of downtown Royal Oak, the former right-of-way along Fourth Street became a tree-lined boulevard. South of Fourth, most of the line eventually became the route of today’s I-75 Freeway. When my father was a young child, every summer after the school year was finished, he would get on the interurban and travel from Detroit, where they lived to his grandpa’s farm in Oxford, Oakland county, Michigan. He really enjoyed spending those summers with his grandparents and told us about how they would stop at Bagley Crossing to let him off the interurban where his grandpa would meet him. I would like to know where Bagley Crossing was (or if still is known). I was born in Detroit but have lived for the past 43 years in Colorado. Ancestry got me interested but there are only a handful of cousins still living in Michigan and all of the previous generation has passed away. If anyone knows of this particular crossing or a location where it might have been located, I would like to know so that one day I might go and see it for myself. Thank you in advance.